Whether I am teaching a diverse group of international students or students from similar backgrounds, my challenge is to guide those students to the knowledge and skills they need to become insightful social thinkers. I also strive to inspire their curiosity, so they can more fully engage their sociological imaginations. Meeting these goals requires both recognizing the pedagogical value of student diversity, and developing lesson plans that meet students’ varied educational needs. In my teaching at College of DuPage, Ritsumeikan University, and UC Davis, I have worked with diverse student populations and diversity issues have been a core topic in my undergraduate and graduate courses. As an international, English-language program, Ritsumeikan’s Global Studies major attracts students from around the world, including students who have felt marginalized in their native-language programs because of their race, ethnicity, religion, or sexual orientation. Openly discussing topics such as race, gender, and sexuality—topics that are often given little attention in the curricula of these students’ native countries—has created an inclusive environment for these students, as shown by their spirited engagement in class. To engage my students, I focus both on discrimination and on the privileges that those in the dominant group receive. Through this approach, I avoid framing the issues as only about “minorities,” and reinforce that we all play roles in systems of inequality. We discuss diversity in many forms, including sexuality and gender, and how such differences have been marginalized as deviant. In this sense, acknowledging and appreciating diversity challenges these exclusionary notions and presents a broader vision of the classroom and society. It also creates an environment in which minority students are welcomed as full members of the classroom, and not as students whose presence is mentioned only when talking of discrimination. Teaching about diversity in Japan challenges the dominant narrative of Japan as homogeneous, a narrative that treats minorities as permanent outsiders and pressures them to pass as Japanese. Japanese students often know little about diversity, and see the nation as a place with few, if any, non-Japanese. Thus, students approach the material with ideological blinders and my challenge is to engage them in seeing from a new perspective. This challenge is similar to that of teaching in relatively homogeneous classrooms in the US: encouraging students to engage with new ideas, including seeing how our social locations limit our view of the social world. To fulfill my goals of public service and community engagement, I regularly invite guest speakers to address issues of diversity and inclusion, including: founders of the Hafu Project and the co-director of the documentary film Hafu to address the experiences of mixed-race people in Japan; the director of Mixed Roots Japan to discuss outreach efforts for people of mixed ancestries in Japan; the director of the Filipino Migrants Center to discuss her organization’s efforts to address domestic violence, undocumented migration, human trafficking, and stateless children in Japan; and filmmaker Dave Boyle and actor Parry Shen via Skype to discuss their efforts in challenging racial stereotypes in Hollywood. Beyond the classroom, I have also been active in community outreach to minority youth in Japan by participating in the activities of Mixed Roots Japan, a group that serves Japan’s mixed-race, immigrant, and ethnic minorities. Through this group, I have joined community workshops and social gatherings, and spoken on the Mix Roots Radio program. In doing so, I am modeling the civic engagement that I encourage my students to perform. Part of encouraging students’ engagement with the sociological ideas is getting them to write; however, many students enter Ritsumeikan’s Global Studies program with little to no experience writing Western-style academic essays. To build students’ skills, I assign several different types of writing. In addition to assigning extended term papers, I use online discussion groups, where each week students post original comments and questions on the class readings and respond to their classmates’ posts. By providing students an easily accessible forum for sharing ideas, the online posts have enabled students to more actively engage with the class material. Students also write public blog posts for our website, japansociology.com. The blog has attracted a growing following, with over 225,000 views in its first few years. The blog has been cited in the Japan Times, and a few student posts have attracted significant attention. A Japanese site translated one student post on glocalization, leading to over 1,700 views in a day. Another student post on Japanese stereotypes of African Americans has received nearly 40,000 views. While most student work sits unread in students’ drawers after being graded, the blog lets us share students’ ideas with the world and continue the discussion outside the classroom. The prospect of engaging with the broader public as part of their academic studies also inspires students to examine the topics more closely and improve their writing. Many Ritsumeikan students also start university reluctant to speak up in class because they have little experience with such discussions. Thus, I re-designed Ritsumeikan’s first-year seminar to teach those skills, including strategies for giving presentations. I introduced PechaKucha talks, in which speakers show 20 slides for 20 seconds each, while giving a six-minute talk, to move students away from the rote use of PowerPoint. This approach has helped transform students’ presentations into informed, unique visions of the issues that connect the speakers with their classmates. I have also taught a variety of strategies for leading and participating in class discussions, including small- and large-group activities. These skills empower students to be more active participants in their education, and help them build the human and cultural capital they will need in the global job market. As the Global Studies program attracts students from around the world, I have also worked to rely less on US-centered examples. For example, in my Introduction to Sociology class, we connect analyses of American parenting strategies to similar strategies in Japan, Korea, and China, including discussions of gender roles and social class. Finally, I believe in fostering a sense of community and teamwork with faculty and staff. 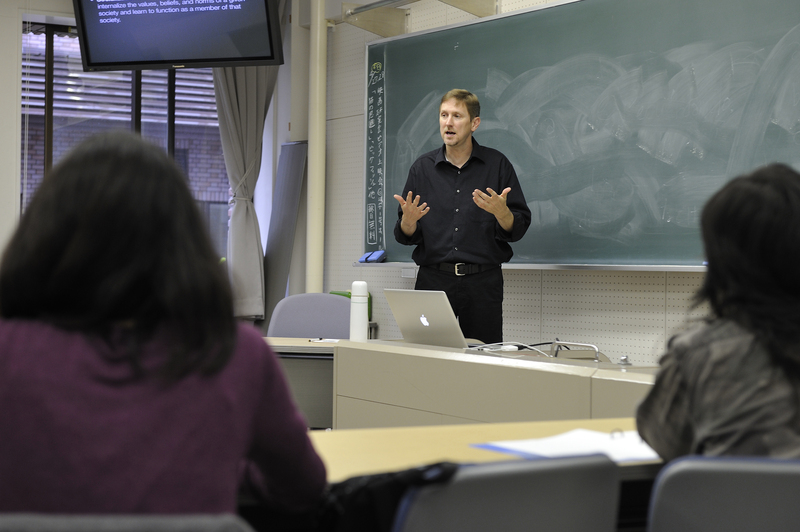 Building the Global Studies program has required collaborating with international faculty and Japanese staff members across linguistic, cultural, and disciplinary lines. This has included developing curricula to connect student learning across disciplines, sharing teaching strategies to address students’ varied command of English, and developing policies on student plagiarism. All of my pedagogical strategies are dedicated to developing students’ sociological imaginations in ways that will remain with the students long after they leave my classroom. Whether in small classes or large, I am dedicated to bringing the insights of sociology to students’ lived experiences, both at the local and global level. -People afected or interested about the issue can lear more about. -Researchers can access easely to information. -Future students have the oportunity to see the work that the department of Ritsumeikan University is doing. -Knowledge spreads around the world. -Everyone can discuss about that issues. Congratulations for that great work and I will keep online following all of you!